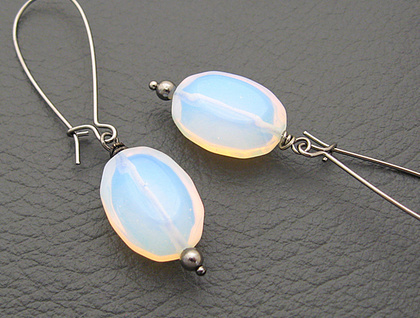 Stunning ovals of sea opal are wire-wrapped and suspended from gunmetal-black ear wires. 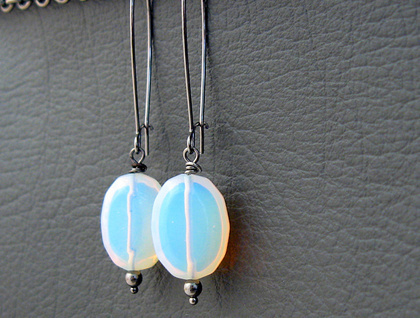 Beneath each sea opal bead is a small, smooth, metallic black bead, adding a graceful finish to this simple earring design. 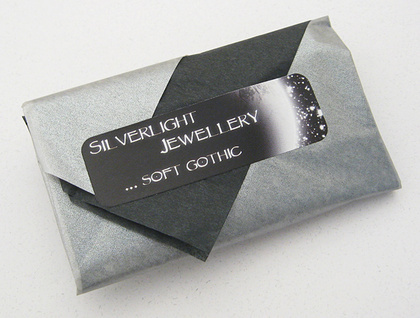 The earrings measure 59mm from top to bottom. 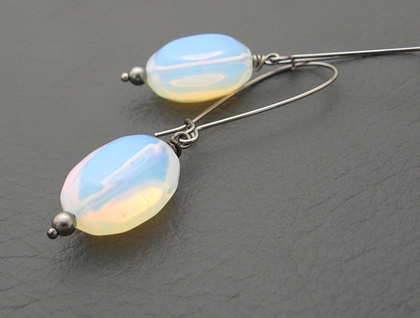 From the bottom of the ear wires, the drops are 26mm long, while the 'sea opal' beads are 13mm wide. The gunmetal black, kidney-shaped ear wires are copper based and are without nickel, so most people with sensitive ears should be fine wearing these earrings. Keeping the earrings hanging, rather than jumbled up in a jewellery box, will help to ensure that the ear wires do not get opened or bent by other jewellery pieces pushing against them.